While we were there, we took the Palm Springs Tramway up to Mount San Jacinto State Park that sits atop the San Jacinto mountains which make up the beautiful backdrop to all of those outdoor Palm Springs Instagrams you've been scrolling through. All of the winter storms had covered the top with a decent snow pack and there were some whispy clouds forming and dissolving throughout the day, making for a really unique experience. The park at the top is enormous and almost always green. It provides a wonderful cool break from the 100-degree-plus summer temperatures of the desert and you can hike and camp year-round, and ski and sled in the winter when there is snow. Bring a jacket though. At 8,500', it is always a bit chilly, even in the summer. The Saturday night we were there, Atomic Ranch invited us to their party at "The Lost Wexler" house. This house was purchased in pretty bad shape and the homeowners wanted to rehab it to what the architect had originally intended it to be. Little did they know when they bought it that it was designed by famed MCM starchitect, Donald Wexler. 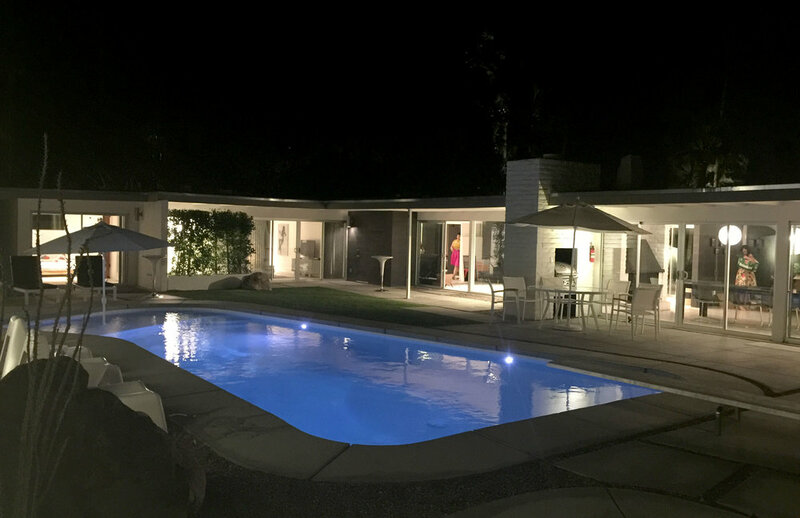 The property rehabilitation effort was led by Troy Kudlac at KUD Properties, who has started to build new construction, fully-licensed Eichler homes in Palm Springs. KUD Properties unveiled their two newest properties (364 E Sonora Rd, 398 E Sonora Rd) during this year's Modernism Week. Backyard pool shot of the party house. From left to right: Henry Jara (Casara owner), Robert Maurer (designer), Becky Maas (Atomic Ranch), Glen Warren (designer). Becky is showing off a puzzle given to her by a vendor during the party. 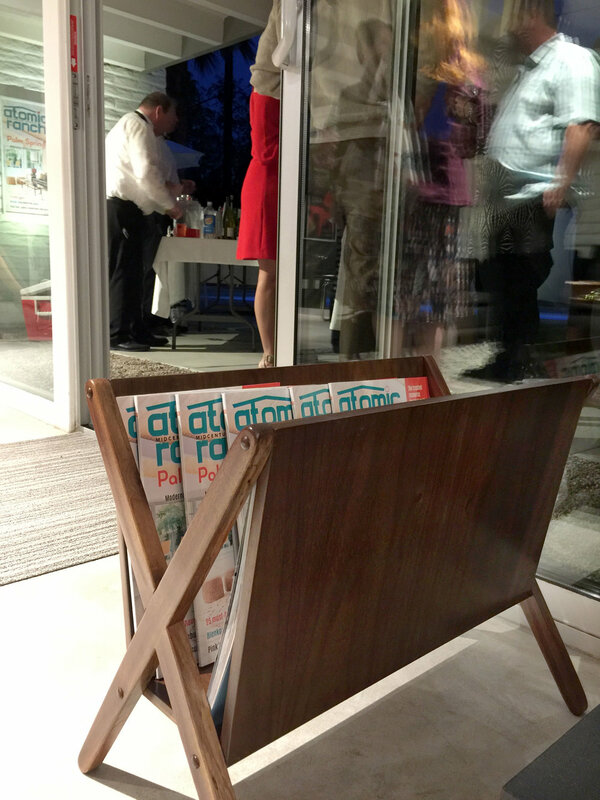 A shot of the magazine rack we made and gave away with Atomic Ranch during Modernism Week. We will add this to our product line soon! Hanging out with famed artist and friend of the company and happy customer, Shag! From right to left: Glen Warren (designer), Becky Maas (Atomic Ranch), Josh Agle (Shag), Robert Maurer (designer). On Sunday, we sold some amazing vintage finds along with some of our own furniture at the official Modernism Week Flea Market. Overall, it was a very successful Modernism Week. Congratulations to all of our friends and colleagues who showcased their work and shared their wonderful talents during this marvelous week. See you next year! We're featured in HGTV Magazine & Atomic Ranch!